30 (Gallons) - 19" (Dia.) - 33" (Height) - .187" (Wall Thickness) - 15 lbs. (Approx. Wt.) This drum has a 2" and 1" plug on top only - Our Dura-LIFE® Drums are the most versatile, durable, and reusable on the market. Our drums require no restraightening or rework as compared to steel drums. With the heavily constructed walls, they will outlast a blow molded drum many times over. Applications include shipping or storing chemicals, oil products, cleaning products, industrial chemicals, concrete chemicals, inks , food products, commerical detergents, and many other uses. Our Dura-LIFE® drums are available in Tight Head, Sealable Open Head, and Slip on Lid sytles to meet your specific application. The Sealable Open Head Drum comes standard with a 304 grade stainless steel drum ring. 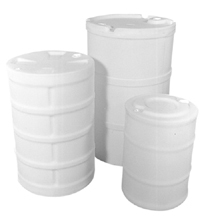 Our drums meet FDA specifications and are lightweight to reduce your shipping costs.